In 2012, the European Central Bank (“ECB”), under the presidency of Mario Draghi, announced the Outright Monetary Transactions Program (“OMT”), which allowed for the purchase of government debt on the secondary market. This announcement came long before Draghi’s announcement on January 22, 2014 that initiated the spending of €60 billion per month on assets including government debt instruments. Certain groups in Germany, a country that objects to asset-buying programs, opined that the program was illegal. Where European Union Member States have the responsibility to challenge the actions by the ECB that conflict with EU law, OMT opponents, both individuals and a parliamentary represented political group, brought suit in Germany’s Federal Constitutional Court (Bundesverfassungsgericht or “BVerfG”) for the German government’s failure to challenge the ECB’s measures. The BVerfG’s initial decision found the bond-buying program to be unconstitutional, but submitted the issue to the European Court of Justice (“ECJ”), recognizing the high court’s judicial supremacy on these issues, for certification of two questions: first, whether the ECB’s OMT program is actually an exercise in economic and monetary policy, and second, whether the purchase of government bonds in the secondary market directly contradicts the law governing the ECB. Advocate General Cruz Villalón issued a preliminary opinion to guide the ECJ in its decision to come in the future. It is the procedure of the ECJ for the Advocates General to submit to the Court a completely independent legal solution to the case. Villalón’s opinion came at a crucial time, just days preceding the OMT expansion announcement by Draghi. Villalón’s opinion is the key to whether or not Draghi and the ECB Governing Council will have authority to continue quantitative easing in the Eurozone. While the ECJ has yet to deliver the binding determination, this article will discuss the law governing the ECB’s recently announced program; Villalón’s conditional acceptance of the program; and the measures the ECB has taken to protect the legality of program. The proper authority granting and demarcating the power of the ECB is the Treaty on the Functioning of the European Union (“TFEU”), and Protocol No. 4 on the Statute of the European System of Central Banks and of the European Central Bank (“Statute”). The ECB “has a high degree of functional as well as organic independence” that protects learned and researched governance from political pressures of EU Member States. The ECB maintains control over monetary policy to affect the “primary objective” of price stability, but is specifically prohibited from funding Member State debt and from directly purchasing Member State government debt instruments. Furthermore, the ECB is given the power to control monetary policy through the use of open market operations, or the buying and selling of assets on the open market on condition that they announce the methods and conditions of conducting those transactions. Consistently, however, with TFEU Article 123, the ECB cannot attempt secondary debt purchases in open market operations to bypass the prohibition of funding Member State debts. Advocate General Cruz Villalón provides an apt analysis of the broad framework and objectives of the ECB under the Treaty. While this article more particularly analyzes his decision on the per se prohibitions of the black letter, the arguments he provided for the first question concerning the substance of the policy itself lend to an excellent interpretation of the ECB generally. In his preliminary opinion, Villalón emphasizes the ECB’s “functional as well as organic independence.” In the interest of preserving the monetary union and meeting the objectives of price and financial stability, the ECB ought to be afforded deference where the governing law is incredibly difficult to amend (unlike other central banks); any judicial restriction may critically cripple the efficacy of the institution. Furthermore, this independence also necessarily shields the institution from political influences that may hamper the actions of the ECB or unduly misdirect its influence. The level of sophistication required to design and implement monetary policy across a large and highly diverse socioeconomic confederation emphasizes the practical benefits of both of these factors. But, just as the Treaty mandatorily provides for the powers of the ECB, it also creates strict limitations on its powers. While the ECB holds supreme power to affect monetary policy, the power to control economic policy remains with the Member States. Draghi’s opponents maintain that the current bond-buying scheme would fall under economic policy. Conversely, it is Villalón’s opinion that the ECB program is a part of monetary policy, if the program’s primary objective is to maintain price stability and it uses a monetary policy instrument to meet it. In short, Villalón opines that the OMT is monetary policy and thus intra vires because: the ECB has specifically stated that the OMT is for the primary purpose of affecting monetary policy in the Eurozone; the program is a necessary signaling tool in a very poor economic climate; and the ECB deserves greater deference in its attempts to remedy the recession. Additionally, Villalón applies a proportionality test where the German opposition argues the ECB unduly increases its risk exposure with the OMT. However, as Villalón explains, there is inherent risk in all financial transactions and in asset-buying programs. With respect to limitations, the ECB placed quantitative limits on the number of bonds purchased both in total and from each Member State. The objective of the ECB is to lower interest rates—a traditional monetary policy tool in economic recession—to an appropriate macroeconomic market level. It is unconvincing to argue, and Villalón asserts as much, that because of the poor conditions of Eurozone economy, especially in certain Member States, that the risk of default is inevitable. If one were to follow this argument to its logical conclusion, one would expect the central banks of Japan, the United Kingdom, and the United States to have all defaulted. The objective-oriented law governing the ECB drives Villalón’s constitutional analysis and remains an overarching theme in his discussion of the mandatory prohibitions of Member State Financing. The ECB and the parties before the BVerfG concede that the Treaty prohibits the funding of Member State debt through the purchasing of government securities on the primary market. However, the German opposition argues that the purchases on the secondary market can create a similar effect under the right circumstances and thus serve to circumvent the explicit prohibition. This substantive threat manifests if the secondary market purchases artificially set the prices of the instruments and encourage private purchases in the primary market. Villalón’s response draws a conclusion based on an interpretation of the TFEU, the Statute, and the Regulation. Villalón asserts that EU law is mandatory in nature, creating powers and placing restrictions with the black letter of the law. His analysis follows the statutory language precisely but also looks to the goals and history of the drafting. First and foremost, the ECB must meet its objective of price stability laid out in TFEU 127(1), accomplished through the use of open market operations stated in section 18.1 of the Statute. But the prohibition in TFEU 123 would seemingly be at odds with this, disallowing the purchase of government securities directly from the issuer. Regulation No. 3603/93, released before the incorporation of the ECB, strengthens the oppositions’ position. This regulation strictly prohibits secondary market purchases that circumvent TFEU 123. Here, Villalón explains, the drafters were concerned with the potential fragile financial conditions of Member States, and created this legal framework to ensure that no member would rely on the ECB for a source of government handouts. The law governing the Eurozone was designed so that the Member States would remain financially responsible and that the ECB would have a “no bailout” policy. According to Villalón, the drafters created the monetary financing prohibitions because such measures would jeopardize the Member States’ ability to meet financial obligations, create significant price inflation, and substantially threaten the main objective of price stability. The ECJ, ruling earlier in Pringle on an issue of assumption of Member State debt, held that the prohibitions set out in the Treaty “contribute ‘to the attainment of a higher objective’ of maintaining financial stability of the monetary union.” Here, Villalón seems to point out that although the restriction is a mandatory one, an exception could be found where the objective of price stability is furthered under the circumstances. His analysis of the drafting history explicitly reaches this conclusion. Looking to the drafting history, Villalón notes that the last line of TFEU 123 was written at the final stage of the drafting to qualify section 18.1 of the Statute. This timing is critical to the understanding of the prohibition against purchasing government bonds. Where the ECB is given asset purchasing power through 18.1, the explicit prohibition of direct purchases must be read to implicitly allow for indirect purchases to affect monetary policy. Villalón argues that this interpretation is necessary for the practical operation of the ECB. Without the final clause, TFEU 123 would per se preclude any purchase (even in the secondary market) of government securities, because any purchase would technically constitute a funding of government debt. Thus, the parties concede that the ECJ should review the ECB’s measures for substance rather than form. Villalón concludes that in light of the governing provisions, the ECB must provide particular safeguards for government asset purchasing programs. Villalón’s conclusion rests on a finding that certain features of the OMT do not per se violate the Treaty. The four significant threats to the prohibition of direct government funding are: pari passu status, default risk, holding period length, and time of purchase of the government assets. These present the greatest obstacles to the program’s legality. The purchasing of government securities with pari passu status levels the ECB’s interest in default to equal all other investors. The opposition argues that without stricter rights under default, and thus a less effective claim against the debtors, the purchases are an indirect funding of government debt. Villalón asserts, however, that this is conditioned on default and is not an intrinsic component of the program. Furthermore, the ECB will push for full payment and never vote for a restructuring or extension of additional credit. The provisions for collective action for all investors are further protected by ECB-imposed limitations on issue size and aggregate holding. Additionally, the pari passu status of the ECB’s investments provides for less market disruption, because a senior position on the assets might otherwise discourage other potential investors. Thus, this safeguard effectively furthers the ECB’s objective by having less influence in the market. The opposition also argues that where the ECB may look to purchase financially unstable Member State securities, the purchase of poor credit rating assets is incompatible with the objectives of the Treaty. Again, Villalón points out that risk of default is not intrinsic to the program, and the risk of default presents itself in every open market transaction. Essentially, following the opposition’s argument to its logical conclusion, all actions on Statute section 18.1 would per se violate TFEU section 123. This was clearly not the intention of the drafters, and Villalón makes a similar point when discussing the drafting of the prohibition of direct government financing. Looking to the program, the ECB states its objective of interest rate stabilization and reduction of financing costs so that Member States may meet obligations without the aid of direct financing—directly opposite to monetary funding that would reduce the States’ abilities to meet debt obligations. In the interest of avoiding this risk altogether, the ECB requires the assets to meet a specific credit rating, and originate from a limited category of established institutional and government entities. With respect to Member States participating in a financial assistance program, the ECB will subject those assets that fall short of the “first-best credit assessment” to a review under which suspension of eligibility remains in place, pending a positive outcome of that review. As is stated above, the ECB places limitations on the number of assets purchased from an issue and from an issuer. The ECB will purchase only up to 33% of assets of a single issuer and will purchase no more than 25% of a single issue. This also has the effect of allowing pari passu status for the benefit of other investors. These limitations have the effect of safeguarding the concerns of the opposition who believe that the ECB, who will hold assets to maturity, will artificially decrease the supply of bonds and increase the risks of the investments held. While Villalón rested his conclusion on the fact that the OMT initially sought the purchase of short-term securities and where the ECB announced that it will purchase bonds with maturities of as much as 30 years, there is no indication that the purchases will actually be held to maturity. Furthermore, the crux of Villalón’s argument rests on the objective of those safeguards rather than their form. Villalón argued that the original maturity limitation showed commitment to avoiding default risks and distortions of the market. The limitations on purchases from each issue and issuer have the effect of diversifying the ECB’s holdings, and limiting the risks of loss and distortion. Furthermore, the limitations cut against the implication that Member States are receiving monetary funding by disallowing purchases of large portions of any one State’s assets. Therefore, these limitations are in line with Villalón’s reasoning and conclusion. Finally, if done too quickly, there is a concern about the effect of purchasing large volumes of government securities on the secondary market. If affected immediately following a primary issue, large scale purchases could in effect set bond prices, essentially mimicking a purchase on the primary market and contradicting the basis of the Treaty. But, the ECB will implement an “embargo period” where the purchase of securities will lag behind the primary issue and the date at which the ECB will begin purchasing certain issues will remain unannounced. Therefore, the ECB alleviates concerns for influencing bond prices and markets, and investors will be devoid of information on which to trade with artificial advantages. The ECB has substantial safeguards in place to cure the range of defects that could place the government asset-purchasing program at odds with the law of the EU. Villalón was satisfied with the initial terms of the OMT, and the subsequent announcement of the expanded program confirms the ECB’s commitment to its primary objective and to its operation within the bounds of the Treaty. Advocate General Villalón’s preliminary opinion will help guide the ECJ’s decision on the legality of the ECB’s bond buying program. The main constitutional issue here for Draghi lies in the explicit prohibition against purchases of government securities by the ECB. Villalón would allow the program to proceed so long as the safeguards, which are designed to cure the dangers of Member State financing that the Treaty aims to protect against, are properly maintained. There is concern over whether Draghi’s plan will meet the ECB’s objective of price stability in the midst of turmoil in the Eurozone. Yet, the legal challenges seem to be quelled at this stage, pending of course an official ruling by the ECJ. The OMTprogram is unprecedented in the EU, but its implementation comes under unprecedented circumstances. The ECB will proceed by purchasing assets and publishing its activity on a weekly and monthly basis. Interestingly enough, should the ECB fail to remain within its self-imposed limitations designed to safeguard the legality of the program, an ever-vigilant opponent of quantitative easing may have room to bring another challenge with the proper evidentiary support. Citation: William Morici, Peter Gauweiler et al v. Deutscher Bundestag: The Legal Impetus behind Mario Draghi’s Movement for Quantitative Easing, 3 Cornell Int’l L.J. Online 10 (2015). *William Morici is a J.D. candidate at Cornell Law School, where he is the Cornell International Law Journal’s Senior Online Editor. He holds a B.S. in finance from the University of Minnesota. Press Release, European Central Bank, Technical features of Outright Monetary Transactions (Sept. 06, 2014), available at http://www.ecb.europa.eu/press/pr/date/2012/html/pr120906_1.en.html. Introductory Statement with Q&A to the Press Conference, Mario Draghi, President of the European Central Bank, Frankfurt am Main (Jan. 22, 2015), available at https://www.ecb.europa.eu/press/pressconf/2015/html/is150122.en.html#qa. William Morici, Remedying the Recession in the Eurozone: Budgetary Austerity v. Quantitative Easing, 2 Cornell Int’l L.J. Online 166 (2015), available at http://cornellilj.org/remedying-the-recession-in-the-eurozone/. Opinion of Advocate General Villalón, Case C-62/14, Gauweiler v. Deutscher Bundestag, 2015 E.C.R. I___, ¶¶ 23–24 (delivered Jan. 14, 2015) (judgment not yet issued) [hereinafter Opinion of Advocate General Villalón]. Id. at ¶¶ 5, 8. See generally Opinion of Advocate General Villalón, supra note 4. Press Release, Court of Justice of the European Union, According to Advocate General Cruz Villalón, the ECB’s Outright Monetary Transactions Programme is Compatible, In Principle, With the TFEU (Jan. 14, 2015), available at http://curia.europa.eu/jcms/upload/docs/application/pdf/2015-01/cp150002en.pdf. Consolidated Version of the Treaty on the Functioning of the European Union arts. 119, 123, 127, 2012 O.J. (C 326) 47, 167 [hereinafter TFEU]. Protocol (No. 4) on the Statute of the European System of Central Banks of the European Central Bank, Annex, arts. 18.1–2, 2012 O.J. (C 326) 230, [Hereinafter ECB Statute]. Council Regulation (EC) 3603/93 of 13 December 1993, Specifying Definitions for the Application of the Prohibitions Referred to in Articles 104 and 104b(1) of the Treaty, 1993 O.J. (L 332) 1, 1. Id. at ¶¶ 108­, 111. TFEU art. 119; Opinion of Advocate General Villalón, supra note 4 at ¶ 125. Opinion of Advocate General Villalón, supra note 4 at ¶ 94. See Morici, supra note 3. Opinion of Advocate General Villalón, supra note 4, at ¶ 204. Id. at ¶ 215; TFEU art. 127; ECB Statute art. 18.1. Opinion of Advocate General Villalón, supra note 4 at ¶ 125. See Council Regulation (EC) 3603/93, supra note 17, at 1. Opinion of Advocate General Villalón, supra note 4, at ¶ 217. See Case C-370/12, Pringle v. Gov’t of Ireland, 2012 E.C.R. I-0000, available at http://eur-lex.europa.eu/legal-content/EN/TXT/PDF/?uri=CELEX:62012CJ0370&from=EN. Opinion of Advocate General Villalón, supra note 4 at ¶ 219, (quoting Pringle v. Gov’t of Ireland, 2012 E.C.R. I-0000). Id. at ¶¶ 215, 225. Pari passu status of a lender puts that lender on “equal footing” of other creditors. The interest is non-senior. Opinion of Advocate General Villalón, supra note 4, at ¶¶ 233, 238, 242, 247–48. 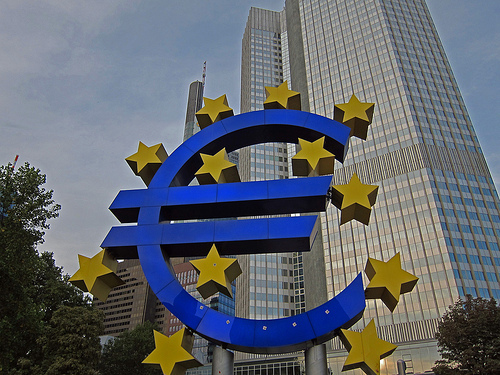 Press Release, European Central Bank, ECB Announces Expanded Asset Purchase Programme (Jan. 22, 2015), available at https://www.ecb.europa.eu/press/pr/date/2015/html/pr150122_1.en.html. Opinion of Advocate General Villalón, supra note 4, at ¶ 236. 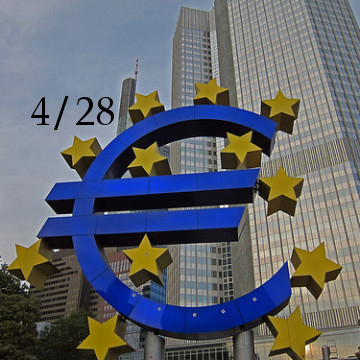 See European Central Bank supra note 61. See Draghi, supra note 2. Opinion of Advocate General Villalón, supra note 4, at ¶ 242. Opinion of Advocate General Villalón, supra note 4, at ¶ 245. See European Central Bank, supra note 61. Opinion of Advocate General Villalón, supra note 4 at ¶ 244. See Villalón Press Release, supra note 11.